26-Mar-2019: Pavitra Sriprakash, Director and Chief Designer at Shilpa Architects Planners Designers writes a weekly column on Sustainability for The New Indian Express titled “ECOLOGIC”. 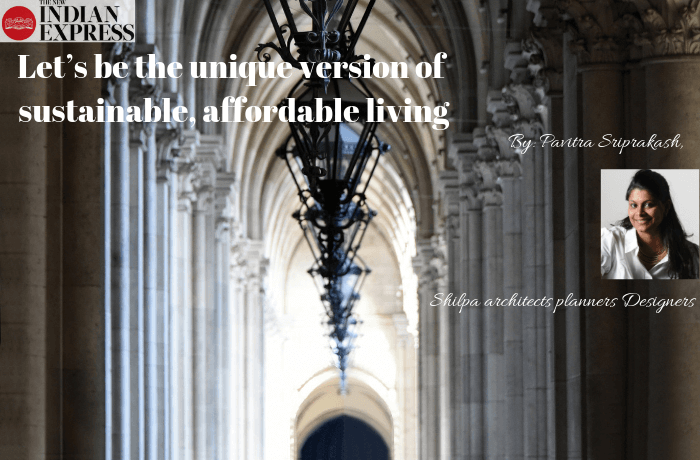 This week she writes how to define our own unique version of sustainable, affordable living in indian cities. Singapore is trending yet again as it has recently been voted as the most expensive city in the world to live in. On the other hand, in India we are talking about affordable living! With such disparity in urban living, is the age old mantra ‘think local act global’ relevant to our affordable and sustainable growth story? India is among the top countries that is expected to have the second highest GDP overtaking the US and second only to China by 2030. Its growth is expected to hit 7.8% fuelled by rapid urbanisation. Cities in India will develop at a rate which is unprecedented and it is impossible to predict how the building industry will respond. Traditional and local architecture is rooted in knowledge that has come in to our cities and urban fabric. Modern architecture tends to be scalable and can be mass delivered in ways that are possible only from factory-like environments. They are not as sensitive to the climate or the types of materials that go into making them. In an age of machines and artificial intelligence, how do traditional building techniques or local materials fit? We require in depth material research that can take our traditionally available materials and adapt them to building techniques that are usable for the types of scales and densities of our future. Only adapted materials will be relevant, else the usage of traditional materials will remain limited to niche architecture. Principles of Indian design and passive techniques that are responsive to geography, climate and sentiment have to be incorporated. Shading, daylighting and ventilation have to be part of the principles of any building design. Our average efficiencies of usage for electricity and water are typically half to one third of what is used in developed countries. Understanding the Indian consumer through data and behaviour is a requirement. Mass affordable and sustainable cities are only possible with data, technology, climate study, and using adapted local techniques and materials which have been re-formatted or re-imagined for a mass production scale. So, let us reinvent Indian Urbanism to be its own unique version of sustainable, affordable living.